Is your garden crying out for some new accessories that you just can’t afford? Our DIY garden pallet ideas will take your outdoor sanctuary from derelict to delightful with minimal expense and effort! You don’t need any special carpentry skills, these quick and easy DIY ideas require nothing more than some basic tools and a measure of creative foresight. The most important step with these projects is proper design and meticulous planning. More often than not, you won’t need to disassemble the whole pallet as you can incorporate its existing frame into the layout. The tools needed for working with pallets are basic DIY utensils that most people already own. Apart from things like hammers, screwdrivers and tape measures, you will also need a drill. If you’re not afraid of elbow grease, you can use a hand saw and sandpaper for cutting and sanding your projects. However, for a more professional finish, a jigsaw or circular saw and an electric sander will save you and your muscles a lot of time and effort. A perfect garden addition for anyone who loves to entertain during the long balmy summer evenings! 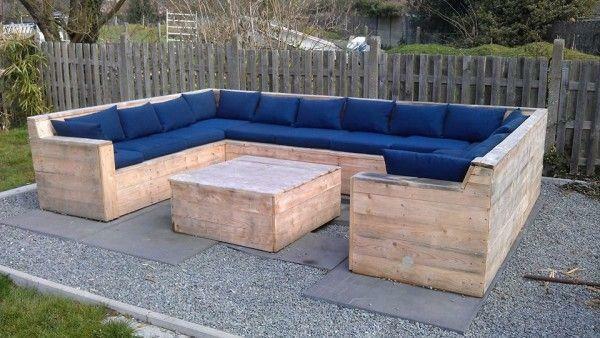 The beauty of building your own outdoor sofa is that you have total control over the design and can develop it to fit perfectly into your garden. They also work out at a fraction of the cost of their shop bought counterparts. Your sofa will be as basic or luxurious as you want it to be. If you’re going for a more comfortable feel, you can pick up some waterproof cushions at your local home improvements store. Or even better, buy some patterned canvas and waterproof cushion filling and make your own! Dreaming of decking? Pallets make excellent decking material. With their platform base already built in, it really is as easy as planning your deck and slotting your pallets together. Remember to use a good varnish to give your decking a perfect finish. Is your back garden a concrete jungle? 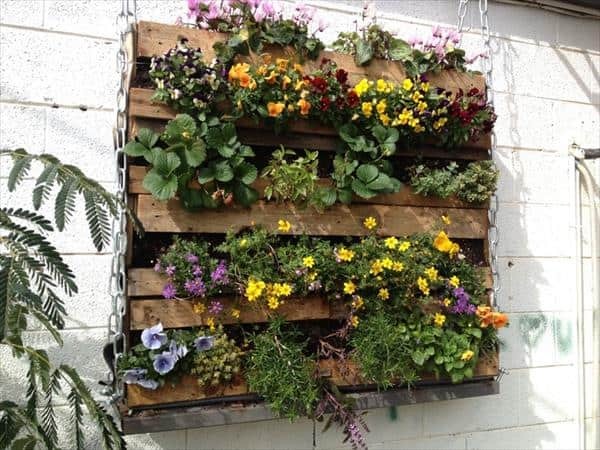 Give it a bit of life with an unusual wall garden fashioned from pallets. Fix a layer of weedmat to the back of your pallet (leaving the top open for water to pass through), pack the crevices with soil and fill with your favourite colourful bedding plants. Attach securely to a wall or fence and there you have it- your very own designer vertical garden! Itching to fire up the barbecue? 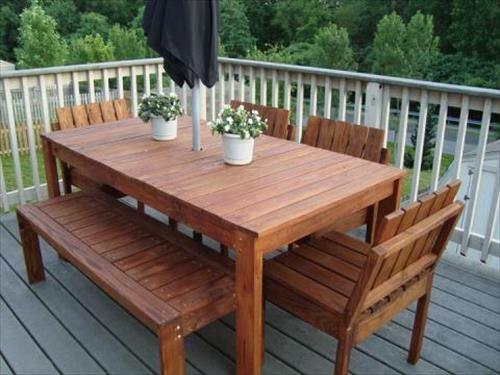 Then you need a set of wooden patio furniture. These sets come in all shapes and sizes, from basic table and chair collections to larger seating arrangements and picnic benches. Save yourself a small fortune by building your own! As with the other pallet ideas, the key is in the planning. Use the natural frame of the pallet to your advantage and don’t forget the all-important varnish to ensure that your furniture set withstands the elements for years to come. Got an empty corner in your porch? Create your very own reading nook by building a frame with pallets and layering an outdoor cushion on top. 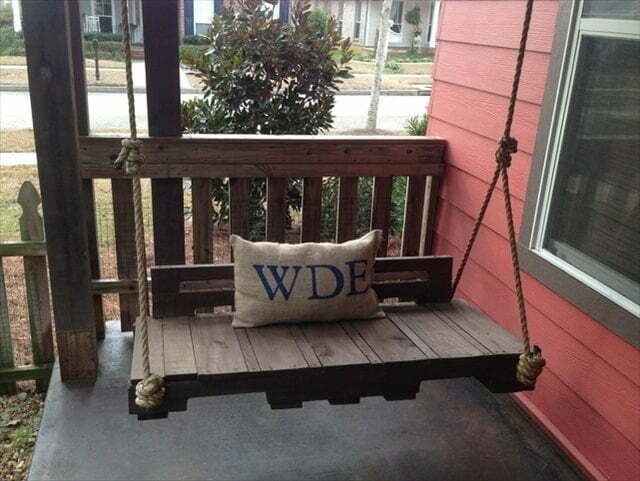 Or if you’d rather spend your evenings gazing out on to the horizon, why not build a sweetheart swing seat? Just be sure that the chains and fixings are strong enough to withstand your weight. 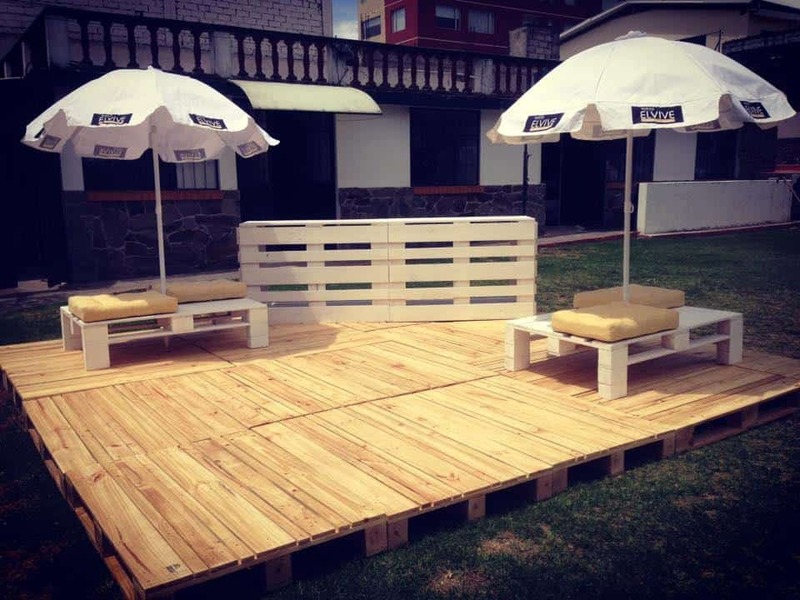 Who would have thought that the humble pallet could be so useful and versatile? You’ll certainly think twice the next time you see one thrown on the top of a rubbish pile. Happy crafting!